Deciphering Indiana Governor Mike Pence's Record On Health Care : Shots - Health News Pence signed into law some of the tightest abortion rules in the U.S., and was slow to respond to Indiana's heroin and HIV crises, critics say. But he compromised with Obama to expand Medicaid. Indiana Gov. 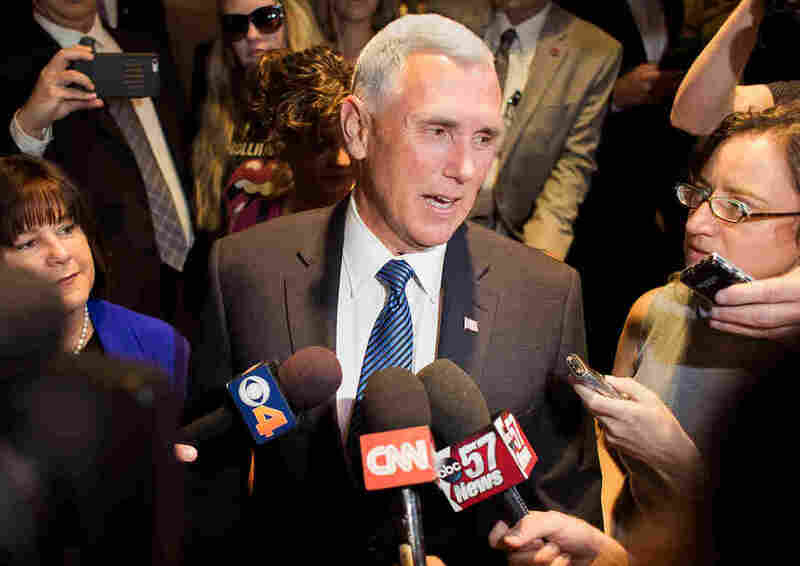 Mike Pence took questions from the media as he and his wife, Karen, left their New York hotel to meet with Republican presidential candidate Donald Trump on July 15. Pence has drawn criticism from the left and the right for various health care stances. Pence has always been a vocal opponent of the Affordable Care Act, even after the federal law passed in 2010 and was upheld by the Supreme Court. But when faced with the choice of whether to expand Medicaid to cover Indiana residents who earn incomes that are 138 percent of the federal poverty level or below, a key part of the ACA, Pence compromised. He debuted a conservative-friendly version of the expansion, one that requires Medicaid recipients to pay a monthly contribution, based on income, into a health savings account. Recipients who miss a payment can be bumped to a lower level of coverage, or lose it entirely, for six months. "It's really been a wonderful way to move the needle both on healthcare access and ultimately on long-term health outcomes," Priest says. Pence took criticism from the right for accepting a component of Obamacare, but his conservative tweaks to Medicaid have other Republican-led states looking at that model. It got so bad — growing to more than 80 cases in the month after the announcement, and more than 190 to date — that the CDC went to Indiana to investigate, and public health experts began calling for a needle exchange. At the time, syringe exchanges were illegal in the state, and Pence was opposed to changing that, at first. He later signed an emergency declaration allowing Scott County to start a needle exchange program. Rather than legalize such exchanges statewide, Pence signed a bill that forces counties to ask permission to start a needle exchange. Only a few counties have done it, so far, because the process takes a lot of planning, local support and money, which the state doesn't provide, says Carrie Lawrence, a researcher with the Rural Center for AIDS/STD Prevention. "If you're the health department with only two part-time staff, and a full-time health director, who's going to do this, and when is it going to happen?" Lawrence says. The HIV crisis also brought some attention to Indiana's lack of public health funding in general, Lawrence says. "I think we are dealing with the consequences of the fact that that we don't have a strong infrastructure for public health in the state," she says. As governor, Pence signed legislation that cut Indiana's budget for public health programs, despite the state's many pressing public health problems. Indiana has a high smoking rate, high obesity rate, and high infant mortality rate. The state is ranked nearly last for both federal and state public health funding. According to Trust for America's Health, Indiana spends just $12.40 per resident on public health. West Virginia, in contrast, spends more than $220. As a member of Congress from 2001 to 2013, Pence voted against funding for health programs such as the State Children's Health Insurance Program and the Prevention and Public Health Fund. As a congressman, Pence was an early advocate for defunding Planned Parenthood, and this year, women's health advocates have clashed with him again. In March, the governor signed a bill that's been cited as one of the most restrictive in the U.S., barring abortion on the basis of disability, gender or race of the fetus. It also requires women to get an ultrasound at least 18 hours before the procedure, and requires that the fetal remains be buried or cremated. Some Indiana women responded by updating the governor's office with (sometimes graphic) news on their menstrual cycles by phone and on social media with the hashtag #periodsforpence. The social media backlash mirrors #periodsarenotaninsult, which took aim at Donald Trump last year. The Indiana ACLU brought a lawsuit against the state's abortion restrictions — and a judge has since blocked portions of that law. "What the state of Indiana has attempted to do here ... grossly flies in the face of existing law," says ACLU attorney Ken Falk. This story is part of NPR's reporting partnership with Side Effects Public Media and Kaiser Health News. For more on Pence, check out this profile by NPR's Nina Totenberg, and a review of his record on education.